Comments: Powerful wether who is without question the widest constructed of the group. When braced, he handles hard with great muscle texture and expression. 886 has a wide square top and big hips. 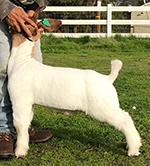 Tricked out with shaggy legs and big bone, this wether should certainly get you noticed in the ring! Comments: 847 represents what we are trying to accomplish at Rumie/ Barak Livestock. He silhouettes with no blemish from the side, all while exhibiting genuine power and balance when viewed from front and rear ends. He is big and shapely in his muscle and bone pattern, complemented with a wide base. Don�t miss out on him, this one is big time!! 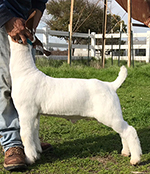 Comments: Even though a little green at this point, this big footed, shaggy legged wether has the overall quality and elegance to make him a very serious contender in the show ring! This guy combines a good bone structure with hard muscle shape. This goose necked wether delivers a square big rack and a flat thick loin. Structurally, he�s correct and agile on both ends. Don�t miss him! 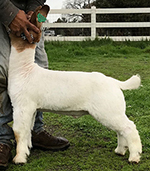 Comments: Athletic build goat that has great eye appeal. 817 is wide topped and good on his bone work. 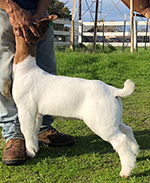 When braced this wether�s silhouette is attractive and he is shallow bodied, level and has a giraffe necked. 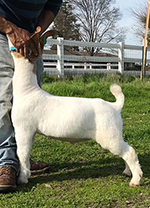 This wide base guy would work well for May, June county fairs!